entry for 's contest Contest! Absolute deadline 31st of March! THIS IS THE LAST EXTENSION. NO exceptions! 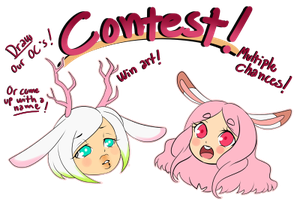 If you can't come up with a name, or want more changes to win something, you can also participate in a DRAWING contest! You need to draw our characters; Eumi and Iriv! Separately or together. You can also include your own OCs! REMEMBER TO TAG US AND THE JOURNAL TO THE PICTURE'S DESCRIPTION! AND SEND US THE LINK TO THE PICTURE! Please send us your entries on 31st of March before midnight (UTC/GMT +2 hours)! Remember to note/link us the finished artwork! You can change the outfits! I do not take point payments, art-trades, requests, collaborations, and any non-cash payment. I got bill and electricity to pay and pets to feed.No refunds.DO NOT send the money before I replied to any message or having an agreement to you.I require full payment before I start working on the commission.I'll send you the clean sketch for approval, if it approved, please make the full payment in advance and confirm it back to me within 24 hours.Any unconfirmed payment(s) will be considered as donation. Thank you so much for entering & best of luck with the contest!! once again, super good luck for this!! XDDD I wish you the best of luck! Ahaha no don't worry about it xD I really love how you drew her <3 Chubby characters are really hard to draw! Eumi in your drawing isn't the skinniest I've seen She still has some weight here! Really, don't worry about it I love it!